The punching movements of boxing are combined with the sense of feeling ( chi sao ) and Hand immobilizations and traps of Wing Tsun . 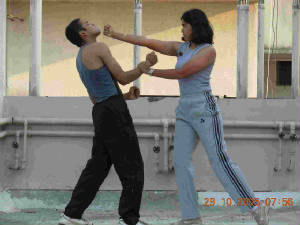 One learns to feel the opponents energies (rather than see) and sense openings by the ancient Chinese exercise Chi-sao. 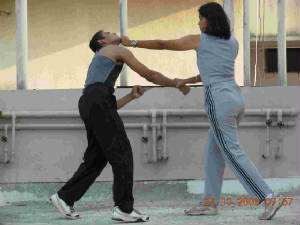 The fixed stance of Wing Tsun is replaced by the leading stance. Wide range of kicks used as opposed to the few straight line kicks of Wing Tsun.